Politicians of all stripes have been claiming credit for welfare reform. It's taken thousands of people off the tax rolls and made them work. But it hasn't worked for everyone. Wendy McCoy is one of those who's fallen through the cracks. The Galesburg mother of three has worked as many as two jobs, collects her child support when the state doesn't garnish it, and still gets deeper and deeper in the hole. Wendy's story is not a pretty one. She was in a serious car accident in 1998 and off work from March to June. The Illinois Department of Public Aid paid the medical bills and $400 a month to support her family. After she was back to work, the held back all but $50 of the child support she should have gotten to reimburse the state for the money paid out after her accident. 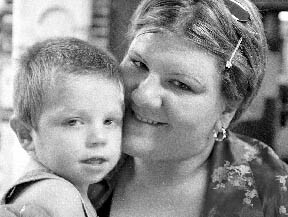 In August of 1998, her son, Brenden, was diagnosed with cancer, neuroblastoma and a malformation of the skull. She was off work again to take care of Brenden. He's has a multitude of surgeries. A while ago, they had a benefit for Brenden. It raised about $5,000 which bought the family a car so they could get to out-of-town doctors and a helmet to protect his fragile skull. ''Even when I'm working, I go deeper in the hole every month. Our food costs about $350 a month and I get only $130 in food stamps. Adding up all the bills, and I'm not extravagant at all but I do have three kids, I need about $1,200 to live on. And that's not paying off any back bills or having a phone or cable TV. With my income, food stamps, Brenden's SSI and child support, I have at most $1,100 a month in income. I go deeper in the hole every day. I sure wish that every time one agency agrees you deserve help, another didn't cut you off.